Woods of Windsor Lavender Fine English Soap, Box of 3 Bars These vegetable-based Woods of Windsor soaps are triple milled using the finest raw ingredients to give a soft lather and delicate fragrance. The triple milled process means that soap will retain its shape even when there's only a small amount left. Triple-milled for longer-lasting luxury, and with only the finest natural ingredients for a soft, rich lather, delicately fragranced with our signature classic Lavender scent combining aromatic notes of patchouli, musk and camomile. Made in England. Beautifully boxed; Set of 3 soaps, each bar 60g / 2.1 oz. 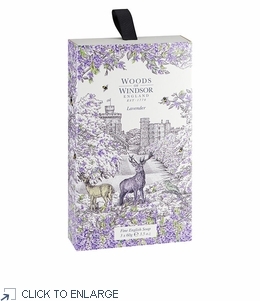 UPC 5060322953526 Dating back to the 18th century, Woods of Windsor is an aspirational range of luxury bath, body and home fragrance products that utilises the flowers, plants and essential oils that can be found in England's historical parks, gardens and stately homes. Inspired by recipes dating back to 1770, Woods of Windsor offers a range of innovative, high quality products, combining natural ingredients and modern technology. These vegetable-based Woods of Windsor soaps are triple milled using the finest raw ingredients to give a soft lather and delicate fragrance. The triple milled process means that soap will retain its shape even when there's only a small amount left. Triple-milled for longer-lasting luxury, and with only the finest natural ingredients for a soft, rich lather, delicately fragranced with our signature classic Lavender scent combining aromatic notes of patchouli, musk and camomile. Made in England. Beautifully boxed; Set of 3 soaps, each bar 60g / 2.1 oz.